The Yarmouth-Freeport varsity girls program came out strong against Biddeford/TA/Wells and rolled to a 7-2 win in their home opener. Freshman Olivia Bradford dominated the face-off circles all night and created several scoring opportunities, but it was sophomore Emma Moll, and seniors Lydia Guay and Ashley Arruda who score two each for the Clippers. Junior Sophie Newberg also netted a goal. Emma Moll started the scoring off in the first period, assisting on the goal was sophomore Lilly Weinrich. Senior Lydia Guay was sent to the box for 2:00 for checking, but Biddeford/TA/Wells was unable to capitalize on the power play and the Clippers took the 1-0 lead into the second period. The Clippers continued to apply pressure in the offensive zone and junior Sophie Newberg was the next player to find the back of the net with a low slap shot from the point. Following Sophie’s goals senior Ashley Arruda netted not only her first goal of her high school career half way through the second but also scored again four minutes later putting the puck over the goalies shoulder off a rebound from Lydia Guay making it a 4-0 game. 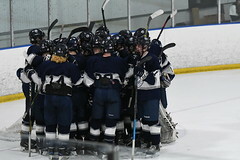 Biddeford/TA/Wells came out with determination to score in the third period and put one in the net four minutes into the period. Senior Lydia Guay scored with six minutes left in the game after stepping into a great face-off win by freshman Olivia Bradford. 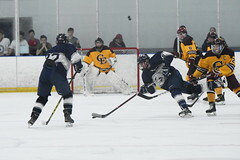 Biddeford/TA/Wells answered thirty seconds later with another goal, but the Clippers were not done scoring. 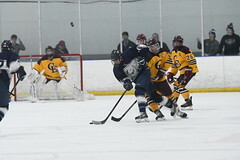 Guay put another puck past the goalie with another face-off win by Bradford, tipped back to defender Kyaira Grondin (by Averil Sahagian), who gave Guay a great pass on the left wing that Guay buried to give Yarmouth-Freeport the 6-2 lead. Moll scored one more goal with 14 seconds left in the game for a final score or 7-2.